A new update for Verizon’s version of the Samsung Galaxy S3 has been approved as build VRBMB1 (Android 4.1.2). The update improves predictive text in the keyboard, allows users to take pictures while on calls, syncs emails better, and enhances Bluetooth. That’s pretty much it, well, other than some added bloatware. It’s not Android 4.2 The update is 150.3MB in size. 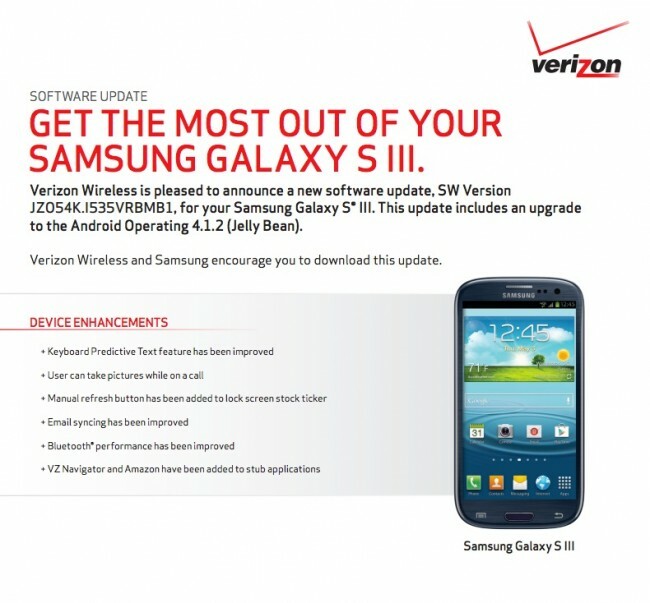 Typically when Verizon approves updates, we see them arrive on devices within a week. The rollout tends to start with a few devices and then rollout to more as the days progress.